This collection of articles reviews the plans of the Indianapolis Motor Speedway to stage an air show during the autumn of 1909. The effort came in the wake of the tragic first automobile race where five lives were lost including two spectators. This forced the founders to pave the track in effort to advance safety. This probably had something to do with the eventual cancellation of the air show but also it is likely Speedway management simply did not plan far enough in advance. The logistics of staging the event may have overwhelmed them and the availability of top pilots and airplanes may have been tight. This article is about the Indianapolis Motor Speedway's plans to expand and improve its facilities in the wake of their controversial first auto meet August 19-21 1909. It was originally published in the September 3, 1909, Indianapolis Star. Check out a September 5 article that focuses more on plans for a new garage area which are barely mentioned in this one. This article is about the Indianapolis Motor Speedway's plans to stage a fall aviation meet in the wake of their controversial first auto meet August 19-21 1909. It was originally published in the September 5, 1909 Indianapolis Star. The attached article, published September 4, 1909 was published in the Indianapolis Star shortly after the first auto race meet at the Indianapolis Motor Speedway. Despite the tragedies endured in that event where five people lost their lives, the Speedway forged ahead with plans to stage an air show and additional auto races in the weeks following the August 19 - 21 races. The attached article from September 5, 1909, was published in the Indianapolis Star and shortly after the first auto race meet at the Indianapolis Motor Speedway. This piece elaborates on one published about the track's plans for an air show in the same newspaper the previous day. It is a great encapsulation of some amazing - and rapid - progress that was being made in airplane technology development at the time. The attached article, published August 27, 1909 was published in the Indianapolis Star just days after the first auto race meet at the Indianapolis Motor Speedway. Despite the tragedies endured in that event where five people lost their lives, the Speedway forged ahead with plans to stage an air show with additional auto races in the weeks following the August 19 - 21 races. 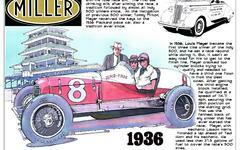 Indianapolis Motor Speedway Founder and President Carl Fisher may have been a Hoosier but he had a global perspective. He also harbored a great deal of patriotic enthusiasm. He was keenly aware of developments in Europe, developments he felt threatened the gorwth of nascent American industries and the economy of the United States. The article in attachment Bumbaugh103009 about Captain George L. Bumbaugh's giant dirigible was originally published in the October 30, 1909, Indianapolis Star. Bumbaugh had exhibited his dirigible at the Indiana State Fair in September. The article in attachment IMSaero101109 was originally published in the Indianapolis Star on October 11, 1909. It concerns the Indianapolis Motor Speedway's quest to host the 1910 international air show featuring the James Gordon Bennett Cup for airplanes which was won by American Glenn Curtiss in August 1909. The article in attachment Curtiss101009 originally appeared in the October 10, 1909 Indianapolis Star. While the headline focuses on America's biggest aviation star Glenn Curtiss' pending arrival in the city to visit the Indianapolis Motor Speedway several other prominent figures in the field are noted as well.